In the wake of the dissolution of indie rock heroes Camper Van Beethoven — their underground hit “Take the Skinheads Bowling” is one of our favorite songs of all time — singer-guitarist David Lowery teamed up with childhood friend Johnny Hickman and formed a new band. Eventually they christened the group Cracker and had a few alt-rock hits with tunes such as “Low” and “Teen Angst.” They’ve haven’t put out a new studio release in a few years but they’re currently on tour and they’ve got a new album (or two) in the works. Here’s what Hickman told us in an email interview. You and David have been friends forever. Talk about what it’s like to make music together — what do you each bring to Cracker? Yeah, we’ve known each other longer than Cracker or CVB have been in existence. That’s rare in our line of work, especially when I consider the lifespan of most bands. As far as what each of us brings to the table, that varies as we go but often David will have songs partly or fully sketched out and I’ll add melodies or ideas to them. That or I’ll have a bunch of guitar riff melodies that he or that we build songs around. I write some of our songs separately as does he, but David is much more prolific than I am. He’s pretty amazing that way . . . one of the best writers of his generation, in my opinion. Sometimes it’s just spontaneous and we just make a song from scratch. As I like to say, in Cracker the song is king, not anyone’s ego. It’s really been that way from the start. Once we start working on something new, the song takes on a life of it’s own and pretty soon we know instinctively what to do with it. The songs tells you what it wants. The band formed in 1991 and then immediately had a hit with “Teen Angst.” What was your reaction when that song took off and why do you think it had such mass appeal? The timing was just about perfect for us. We’d come from the same small town (Redlands, California) and had known each other for years, loosely following what the other guy was up to. In 1991 neither of us was in a band for once and we thought, “What the hell? Let’s get together.” Music started happening pretty quickly; it was a great fit. “Teen Angst” was a song David had pretty close to finished and I just added that big guitar riff to it. I loved it immediately. It had a classic Lowery-styled character/protagonist and a lot of attitude. At one point we were messing with it and he asked, “So what else does the world need?” I said, “I don’t know, a V-8 engine?” That was my one very tiny contribution to the lyrics. It’s conjecturable as to why it became our first hit but personally I think it was a combination of things. There were David’s great lyrics, which most people found amusing and thought-provoking and which pissed off some people which is NEVER a bad thing. And it was a big, roaring freight train of a rock song with much smarter-than-average lyrics and my big dumb, catchy guitar riff. It was one of the first of what became a classic Cracker songwriting style. Boom, it broke through to radio! Kerosene Hat, the follow-up to Cracker, became your best-selling album. Looking back on it, what do you think its strength was? Once again, I think timing was essential. We had a great group of very talented people with us AND solid, enthusiastic backing from our label after the first record had done respectably well. The late great Don Smith who had also produced our first record was onboard again. Also, as with the first record we had the brilliant Davey Faragher (also from Redlands) on bass and backing vocals. Davey is a great arranger, singer and co-writer, not to mention one of the best bass players in the world. We also had the young but fantastic drummer Michael Urbano who Davey had brought to the sessions. At the center of it all was David’s brilliant songwriting, of course. Davey, David and I were a good team, throwing ideas around and adding to that core . . . writing as we went along. Looking back, even though Cracker was a successful record, I feel very fortunate that it was our second record that really took off. I think that has a lot to do with our slow, steady fan base growth and current ability to still be doing this. When Camper reformed in 1999, what effect did it have on Cracker? I was pretty surprised because the split had been rather acrimonious, but I also knew that they broke up just as they were getting somewhere. There was always a bit of “what if?” in the air. I also thought that they had been a very unique band and WERE just hitting their stride musically when they split up. Although Cracker kept working as well that year, suddenly I had some extra time on my hands. Instead of sitting around moping about it I wrote and released my first solo album, Palmhenge, which was very satisfying. It was well received by the fans and reviewers, as was CVB’s New Roman Times. Win- win! The two bands have shared the same bill numerous times. Talk about what they have in common and what separates them. Obviously the most important and significant thing we have in common is David and his talents. We’ve all known each other for decades now and there has always been a bit of a friendly rivalry paired with the camaraderie, but that’s probably a good thing. Stylistically, CVB has a bit of prog rock going and a penchant for delving into world musics like ska and Eastern-European-styled melodies. 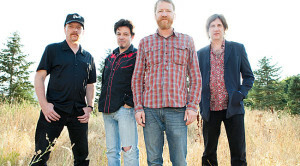 Cracker leans more towards early British rock and pop, alt and classic country blues . . . that Americana thing, as well as this massive, heavy sort of Zeppelinesque thing that we do. You collaborated with Leftover Salmon on an album. What was the experience like? It was one of those fantastic things we all did on a whim really. They were coming through Richmond, Virginia on tour and we had a recording studio there at the time. Salmon was one of the pioneers of blending rock, the jam band thing and bluegrass. Man for man they are some of the best musicians you’ll ever hear. Their take on the Lowery/Hickman songbook floored us and was a blast to make in just a few days of nonstop fun. David and I are always up for joining them onstage too. My face hurts from smiling every time. We love those guys. I think your last studio album came out in 2009. When can we expect a new one and do you have any idea of the direction you’ll take? At this moment we have not one, but two records very close to finished. We are calling it “Berkeley to Bakersfield” at this point because there are basically two sets of music made with different musicians collaborating with us on the recordings. We’ve always recorded with different people when the songs seemed to need that and that’s what this is, just more of a stylistic, fully realized duality involved. One batch of songs (Berkeley) we wrote and recorded with the “Kerosene Hat crew,” as I call them. We reunited in Northern California with Davey Faragher and Michael Urbano, assembled ourselves in a tiny recording studio with all four of us face to face and just dug in. It was fantastic! David brought sketches of songs, I brought a handful of guitar riffs and we all just started creating and hammering them together. It was as if we had never been apart. Suddenly Davey is coming up with a great part or pulling things into shape, turning the music in various directions. Some songs started with Michael laying a great groove down on drums to one of my or David’s riffs. Some songs were birthed spontaneously in the moment by all of us at once. David took the whole batch of music home and wrote some of his best lyrics ever. The other set was mostly David’s songs that we recorded with some great young players in Athens, Georgia. This batch has more of a classic country sound and style but also includes some Lowery narrative/story songs that are just simply timeless and beautiful.